"For the record, Windows Mobile 6.5 is DONE . . . complete . . . looks really good." That was the tweet -- now removed -- by the Windows Mobile Developers Team late last week. Word that Windows Mobile 6.5 has been completed does not necessarily mean your phone is due for an update, but rather that version 6.5 has been sent to manufacturing. And unless you're on a Windows Mobile 6.1-ready phone, you shouldn't really care. Regardless, Windows Mobile 6.5 has failed to make positive headlines (if any) mainly because this version is already out of date. The first Windows Mobile 6.5 phones are expected sometime this fall but Microsoft is already working on a new(er) version of WinMo, namely version 7 -- with the first phones based on it expected in the first half of 2010. Meanwhile, if you are the joyful owner of a WinMo 6.1 phone (the current version) you might get the 6.5 update after the manufacturer of your phone gets the license for it from Microsoft and the customizes it for your handset model. What's new in Windows Mobile 6.5? 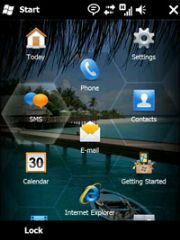 A honeycomb menu screen is one of the most noticeable user interface updates in Windows Mobile 6.5. Windows Mobile 6.5 is not a major upgrade from 6.1 (that's unless you're one of the lucky ones whose phone supports it), but it does include an overhaul of the user interface (UI). As you're been hearing for months now, 6.5 is more consumer-focused and fingertip friendly. A stylus is a WinMo user's best friend. But in 6.5, thanks to Microsoft's generosity, you'll have many UI elements enlarged, so you can select them with your finger. The 6.5 update will also bring a touch-friendly Internet Explorer Mobile, together with the ability to have various items on the Today Screen, such as a music player and a photo viewer. Over 31 Windows Mobile 6.1 devices are said to be able to run the 6.5 update, including a number from HTC, Toshiba, Samsung and Motorola. The Palm Pre is may be one of the hottest phones coming out this summer. If you're planning to buy a Windows Mobile phone this summer, perhaps you should put that thought aside. There are many more exciting and user-friendly phone coming in just a few months. Besides the 3.0 iPhone software update (and some new hardware expected as well), the Palm Pre is set to amaze with its new WebOS and great touch functionality. Also, if you don't like being stuck to just one manufacturer, Google's Android platform might raise your fancy, with more devices running on it coming out in a few months. However, if you're a die-hard WinMo fan, you'd be better off to wait until next year when Windows Mobile 7 will ship, adding a new suite of WinMo apps (IE, email, SMS, photo/music management) and zooming/scaling capabilities to the UI.